Today a Swedish James Bond comic was sold to a new record breaking price. It was the first issue of the comic magazine JAMES BOND AGENT 007 from 1965 that was sold for the record price of 245 Euro / $278 / £179. 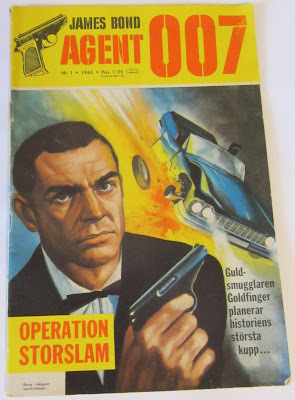 The Swedish James Bond comic ran for thirty years in Sweden (1965-1995). These comics are now 50 years old and very rare to find. One can wonder how many actually exists to this day in good condition. I am happy to say that I have two of these in my collection but I started collecting this magazine when I was 12 years old 26 years ago.